This startup exponential growth calculator can be used to forecast revenue, or in the absence of revenue some other parameter such as active users, for a business in its rapid growth phase of development. A new business will usually experience growth in three stages forming the traditional S shaped curve. Phase 1: Slow Beginning Initially progress and growth is slow, there are a low number of early adopters as the business seeks to establish itself. Phase 2: Steep Acceleration This is the important phase in which the startup exponential growth calculator can be used. There is rapid growth as the business gains traction. Users and possibly revenue growth accelerates, increasing rapidly approaching an exponential growth. Phase 3: Plateau This is the final stage of any business. The growth rate is no longer constant but declines approaching zero as the limitations of size (market, resources etc.) take effect. The revenue and usage is high but growth is zero or even declining. The purpose of this startup exponential growth calculator is to help forecast during phase 2 of the businesses lifecycle, in which it experiences rapid exponential growth. The startup exponential growth calculator can be used to estimate revenue or any other parameter such as active users which are forecast to grow at a rapid exponential rate by entering details relating to the current revenue or users, the periodic growth rate, and the number of periods over which the growth is experienced. It should be noted that the calculator, which is available for download below, is based on a period. A period can be defined as any length such as a day, week, month, year etc. The important point to remember is that the three amounts entered into the calculator must all be for the same period. The startup growth calculator is used as follows. The initial value depends on the purpose the startup exponential growth calculator is being used for. For example, if the purpose is to calculate revenue for a future period, the initial value might be the actual revenue during the period prior to the forecast or, in the case of a new startup, an estimated base level. Alternatively, if the purpose is to calculate active users at the end of a period, the initial value will be the active users at the start of period 1. Examples of using the calculator to calculate revenue and active users are shown towards the end of this post. Enter the growth rate for the period. So for example if the period has been defined as a week then the growth rate entered is the weekly growth rate, likewise if the period is a year, the growth rate entered should be the annual growth rate. Enter the period for which the final value is required. For example, if the period is defined as weekly and the final value if required at week 52 (the end of the year), then enter 52. The startup exponential growth calculator works out the final value allowing for exponential growth at a constant rate. The startup exponential growth calculator is available for download in Excel format by following the link below. Suppose a startup business has weekly revenue of 800, and anticipates weekly growth of 5% for the next 52 weeks. The startup exponential growth calculator is used as follows. In this example the period has been defined as a week. The revenue is currently running at 800 per week and grows at a compound rate of 5% each week. On this basis assuming compound growth, the revenue is estimated to be 10,114 per week by week 52. Suppose a startup business has 500 active users at the start of month 1, and anticipates monthly growth of 15% for the next 20 months. In this example the period has been defined as a month. The active users at the start of month 1 is currently 500 and growing at a compound rate of 15% each month. On this basis assuming compound growth, the active user base is estimated to be 8,813 at the end of month 20. Users use this startup exponential growth calculator at their own risk. We make no warranty or representation as to its accuracy and we are covered by the terms of our legal disclaimer, which you are deemed to have read. 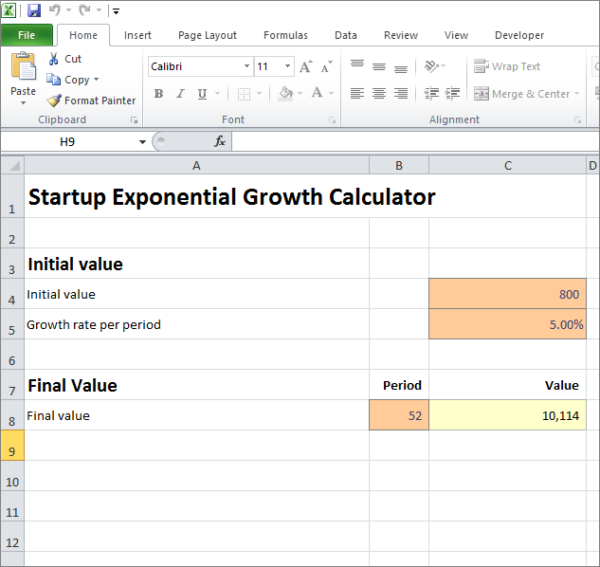 This is an example of startup growth calculator that you might use when preparing financial projections in Excel. It is purely illustrative of revenue growth rate calculator software. This is not intended to reflect general standards or targets for any particular company or sector. If you do spot a mistake in the startup exponential growth template, please let us know and we will try to fix it.